Maruay Garden Hotel is just a 15-minute drive from Don Muang Airport in Bangkok and offers affordable accommodations with easy access to transportation connections. Maruay is just a 10-minute drive away from entertainment venues such as Cineplex Ratchayothin and Central Ladprao Department Store. Exploring the city is also cost-effective with the Mochit SkyTrain station and Chatuchak MRT metro station located nearby. Simply furnished, rooms are contemporary and provide air conditioning, in-house movies and a private bathroom. Lounge by the swimming pool with a refreshing drink from the pool bar or work out at the gym. For those last minute work needs, a business center is also available with wireless internet access. Maruay Garden Hotel offers 3 restaurants for you to choose from. Sample authentic Hong Kong dishes at China Rose or enjoy traditional Japanese fare from the Japanese Corner. Allamanda Coffee Shop is open 24-hours and serves a variety of Asian and western cuisine. With the Nana BTS Skytrain Station at its doorstep, The Landmark has accommodations with Bangkok City views. It features 9 dining options and a 4-story shopping arcade. Located along Sukhumvit Road, The Landmark Bangkok is a 30-minute drive from Suvarnabhumi International Airport and just over 1 mile from Queen Sirikit National Convention Center. Equipped with internet access, modern air-conditioned rooms at Landmark Bangkok feature large windows and a TV with satellite channels. A minibar and a safe are included, along with 24-hour room service. A wide array of dining options can be found at Landmark, such as Rib Room & Bar and Greenhouse – a 24-hour bistro. Chinese, Thai and Western dishes are available at the hotel’s other restaurants. In addition to bars, a bakery and café are also available. Guests can exercise in the fitness center, swim in the outdoor pool or play a game of racquetball. The Landmark Bangkok’s business center is open from 6 am - 12 am. Viengtai Hotel is located in Bangkok’s Banglampu District, next to Khao San Road. It features a restaurant and an outdoor pool that overlooks the city. Guests enjoy free parking. Hotel Viengtai is a one mile from the Grand Palace and Wat Phra Kaew. Suvarnabhumi International Airport is 17 miles from the hotel. Each air conditioned room at the Viengtai comes with a minibar and attached bathroom. A TV with cable channels is also provided. The hotel offers currency exchange services while sightseeing arrangements can be made at the tour desk. For convenience, laundry and dry cleaning services are also provided. A buffet breakfast is served at the Rosirin Buffet Restaurant. Thai and international dishes are available at the Rosirin Coffee Shop. This is the only high-rise towering hotel overlooking the ancient city of Siam to the west, and the bustling China Town to the east, next to the mighty Chaophraya River (River of the King). It also has a magnificent bird eye view of the city of Bangkok. Within minutes of walking distance, one can visit the Grand palace, The Emerald Buddha Temple and more. 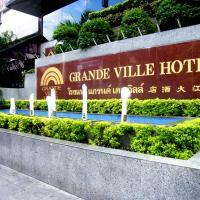 Grande Ville Hotel is a certified 3 star plus environmental friendly city hotel, recognized by the Green Leaf Foundation and the WWF for its accommodation and facilities. Situated just a 2 minute walk from the MRT subway station, in a thriving business and entertainment district, Swissôtel Le Concorde provides well-furnished rooms with high-quality amenities and free private parking. This elegant hotel offers all the facilities needed for a relaxing break or a business trip. Guests can relax by the large outdoor pool, or enjoy one of the various treatments at Le Concorde Spa. The hotel also features a shopping arcade and gym, providing plenty of activities to keep guests entertained. There are many dining options available for guests to try, with 4 restaurants and a bar catering for anything from light snacks to a mouth-watering feast. Swissôtel Le Concorde Bangkok is conveniently situated for easy access to expressways and subways. This allows guests to quickly travel to the convention center and all major Bangkok tourist attractions within minutes. There are also several world-class golf courses available just a 30 minute drive from the hotel. Twin Towers Hotel is located in central Bangkok, a 10-minute drive from Siam Paragon Mall. It features a well-furnished spa, swimming pool and 6 dining options. Free parking is provided. Hotel Twin Towers is a 20-minute drive from Platinum Shopping Center and a 40-minute drive from Suvarnabhumi International Airport. The modern rooms at the hotel come with large windows that offer plenty of natural light. Each room is equipped with a refrigerator and TV with cable channels. Guests can visit Boran Massage & Spa for a traditional Thai massage, or work out at the fitness center. Twin Towers offers currency exchange services while travel arrangements can be made at the tour desk. Gold Teak Restaurant serves a fine selection of local dishes. Other dining choices include traditional Cantonese food at Fu Marn Lau Restaurant and Japanese specialties at Daikoku Ramen. In the heart of China Town, and near the Chao Phraya River, this first class hotel features comfortable facilities, and has Bangkok’s only revolving restaurant and club lounge. Grand China Princess Hotel Bangkok has rooms with light, neutral colors and contemporary design, with carpet floors, a sitting area and large windows hosting majestic city or river views. Grand China Princess is in a convenient location within a short walk of the nearest river bus stop and the Hualampong station, from which you have easy access around Bangkok. In the surroundings there are a variety of shops, restaurants and sights such as the Old Siam Plaza, Wat Suthat and Bangkok Flower Market. For recreational purposes, hotel guests can use the fitness center, have a traditional Thai massage and relax in the sky pool. Whether it's luxurious spa pampering, dancing to famous DJs or sampling fresh pastries, Novotel Bangkok offers it all. Close to shopping heavens, it features a large outdoor pool with sauna/steam rooms and a day spa. Rooms include a plasma TV, a sitting area and and tea/coffee-making facilities. A minibar and 24-hour room service are provided. The fitness center at Novotel Siam Square offers a variety of activity classes. The hotel also provides Wi-Fi throughout the residence, free parking, and a tour desk. Guests can utilize facilities at the business center. Restaurant The Square offers international favorites, while Lok Wah Hin features delicious Chinese cuisine. Entertainment options include Pastel Lounge, B@S Sports Bar and the Concept CM2 nightclub. Novotel Bangkok on Siam Square is a short walk from Siam Square Skytrain Station. It is also near shopping centers such as MBK, Siam Discovery and Central World Plaza. On Wireless Road, Chateau de Bangkok features fully-furnished accommodations with free Wi-Fi. The hotel is a 5-minute walk from Ploenchit BTS Station. It features a rooftop pool, 2 restaurants and elegant rooms with hardwood floors. The spacious rooms at the Chateau de Bangkok come with modern décor, and are equipped with floor-to-ceiling windows. They include a flat-screen cable TV, tea/coffee making facilities, safe and marble bathroom. Enjoy city views from the 14th floor while dining at Panorama Restaurant and Bar, which features an open-air glass roof. Sample Thai and Italian specialties at Paparazzi Restaurant. Room service and international buffet breakfast are also available. Guests can work out at the fitness center or relax in the sauna. A yoga class and spa are provided. Other facilities include the hotel’s shops and business center. Car rental services are available. Chateau de Bangkok is approximately just over a quarter mile from Lumpini Park and 2 miles from Siam Paragon Shopping Center. The Bangkok Hotel Lotus Sukhumvit is centrally located and features free private parking, an outdoor swimming pool and sauna. Bangkok Hotel Lotus is near several shopping and entertainment venues. Phrom Phong Skytrain station is a short walk away. Rooms are equipped with air conditioning, cable TV and coffee/tea making facilities. Free Wi-Fi is available. 24-hour room service is provided. Guests can enjoy a work-out at the fitness center. Bangkok Hotel Lotus Sukhumvit also provides a business center and massage services. Bangkok Hotel Lotus Sukhumvit's 2 on-site restaurants serves international and regional cuisine. The Lobby Lounge serves snacks and beverages. A 5 minute walk from Nana BTS Station, Grand President offers well-furnished studios with kitchenettes in the lively area of Sukhumvit 11. Providing free parking, all 3 towers feature a rooftop pool and restaurant each. Situated half a mile from Sukhumvit Plaza and Times Square, Grand President Bangkok is a 10 minute walk from Sukhumvit MRT subway station. It is an hour’s drive from Suvarnabhumi International Airport. Featuring marble floors and modern décor, rooms at Bangkok Grand President come equipped with a safe and cable TV. Private bathrooms have a bathtub and hairdryer. Guests can exercise at the fitness center or relax in the sauna. Grand President also has a 24 hour self-service laundromat, as well as a tour desk. Breakfast and an international buffet are served at Café 11. Other dining options include Uzuki Japanese Restaurant, The Old German Beer House and 24 hour room service. On Sukhumvit 15, the center of the shopping and entertainment district, Royal President Bangkok offers spacious, well-furnished accommodations with kitchen facilities. It features free Wi-Fi and an outdoor pool. A free tuk-tuk shuttle takes guests to Asoke and Nana BTS Skytrain Stations and Sukhumvit MRT Station. Royal President is approximately a 40 minute drive from Suvarnabhumi International Airport. Along with sitting and work areas, each guest room has a flat-screen TV, a safe and a stereo with CD/VCD player. The attached bathroom provides a bathtub and separate shower. Royal President Bangkok has a fitness center, a mini-mart, and a 24-hour front desk. For guests’ convenience, it provides visa services and tour arrangements. Buffet breakfast is served daily at Royal Brasserie, which also offers Thai and international specialties. Room service can be arranged upon request. Golden Tulip Essential Vasu is in Khaosan, 2 miles from Hualumphong Train Station. A 10-minute drive from Grand Palace, it features a restaurant, indoor swimming pool and rooms with private bathrooms. Free parking is available. Rama VIII Bridge is 200 yards away. 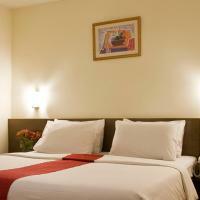 Golden Tulip Essential Vasu is 2 miles from MBK Shopping Mall and Siam Paragon Mall. Suvarnabhumi International Airport is 22 miles from the hotel. The cozy rooms at Golden Tulip have modern décor and plenty of natural light. A TV and minibar is provided in each room. Select bathrooms have a bathtub. To relax, guests can sing karaoke or take a dip in the beautiful indoor pool. The hotel provides currency exchange and airport shuttle services. Laundry services are also available upon request. Cantonese dishes and dim sum are served at Mei Sien Restaurant. Other dining options include Thai and international food at the Coffee Shop. President Park Bangkok has comfortable serviced apartments with full kitchen facilities in the center of Bangkok on Sukhumvit 24. It is just 3 minutes by free tuk-tuk shuttle from Emporium Shopping Center and Phrom Pong BTS Skytrain Station. Elegantly furnished, air-conditioned units feature stunning views of Bangkok City. Each comes equipped with a satellite TV, sofa set and personal safe. Attached bathrooms have either a bathtub or shower. President Park Bangkok is a 5-minute walk from Carrefour and Tesco Lotus. It is a 10-minute drive from Queen Sirikit Convention Hall and a 45-minute drive from Suvarnabhumi International Airport. After a busy day out, guests can rejuvenate with a swim in any of the 3 swimming pools. It also has a fitness center and children's play area. For convenience it also provides a business center for its guests. Buddy Lodge offers modern Thai-style accommodation with numerous facilities, including a fitness centre and rooftop pool. Situated along lively Khao San Road, it has shops, a spa and restaurants. The Buddy Lodge is 1 km from the Grand Palace and 4 km from the MBK Shopping Mall. The Suvarnabhumi International Airport is 28 km away. Air-conditioned rooms at Lodge Buddy feature private balconies and dark wood furnishings. For convenience, guests have the use of a safe and fridge. Marble bathrooms have a hairdryer and toiletries. Wi-Fi is available. Guests can lounge by the rooftop pool with a cocktail from the poolside bar. Relaxing massages and beauty treatments await guests at Kinaree spa. To unwind, sauna and steam baths are available. Dining options at Buddy’s include the 24-hour Mulligan’s Irish Pub and Brick Bar. A wide range of international dishes and Thai favourites are available at both venues. 24-hour room service is provided. Silom City Hotel is located 700 metres from Surasak BTS Skytrain Station and 1 km from Patong Night Market. Enjoying easy access to the city, it provides massages and free Wi-Fi. Hotel Silom City is 800 metres from Chong Nonsi BTS Skytrain Station. It less than 5 km from attractions like the Seafood Market and MBK Shopping Mall. Suvarnabhumi Airport is about 24 km away, while the local market is a 15-minute walk from the hotel. The value-for-money rooms are well-equipped with air conditioning, a tea/coffee maker and a hairdryers. Large windows offer views of the city. Guests can exercise at the gym or stay up to date with news at the business centre. The hotel also provides free parking and laundry services. Silom City Hotel’s restaurant serves a variety of Western dishes, Thai food and Chinese specialities. Refreshing drinks are available at the bar in the restaurant. President Solitaire offers 4-star comfort in spacious rooms with kitchenettes and free Wi-Fi, located a 10 minute walk from Nana Skytrain Station. It features an outdoor pool, spa and buffet breakfast. President Solitaire Hotel & Spa offers free tuk-tuk shuttles to the Nana and Asoke BTS Skytrain Stations. It is a 5-minute drive from Sukhumvit MRT Station and provides free parking. Featuring elegant interiors with hardwood floors, air conditioned units come with a flat-screen cable TV, DVD player and a sofa. Marble bathrooms have a bathtub, bathrobes and hairdryer. Guests can relax in the sauna and steam rooms after active workouts at the gym. Other facilities include a library, business center and a tour desk. Hearty international buffets are served at The Dining Room Restaurant while The Lobby Lounge offers light snacks and live music. 24-hour room service is available. Featuring fully furnished apartments along lively Sukhumvit Road, Admiral Suites is a 15-minute walk from Phrom Phong BTS Skytrain Station. It has free Wi-Fi and a rooftop pool with a hot tub. Admiral Suites Bangkok is 16 miles from Suvarnabhumi International Airport. The hotel is a walk from shopping and dining options at Emporium Mall and Interchange Tower. The spacious suites at Admiral Suites come equipped with a flat-screen TV and well-equipped kitchenette for the comfort of guests. A private balcony and attached bathroom with bathtub are also included. Guests can exercise at the fitness center. The hotel also provides free parking and a 24-hour front desk. Parrot Cafe serves fragrant coffee and hot meals. Other dining options include Tsukumo Japanese Restaurant and room service. Located in Din Daeng District, Princeton Bangkok offers rooms and fully serviced residences near the city centre. The hotel features an outdoor pool, a spa bath and a restaurant. Free parking is available. Rooms at Princeton Bangkok are fitted with a cable TV, minibar and safety deposit box. Guests receive a free fruit basket, bottled water, and daily newspapers. Work out at the fitness centre or have a soothing massage. The hotel also offers limousine service and luggage storage. Enjoy buffet or a la carte dining at cosy Café Princeton, which serves local and international dishes. Princeton Bangkok is a 30-minute drive from Suvarnabhumi International Airport. The hotel provides a free one-way service to selected train stations and shopping centres, such as Pratunam Market, MBK Shopping Centre and Chatuchak Weekend Market. Conveniently in the Sukhumvit business district, Unico Express@Sukhumvit is a 10 minute walk from Nana BTS Skytrain station. It features an outdoor swimming pool, free internet and free parking Sukhumvit@ Unico Express is 1039 yards from Phetchaburi MRT subway station and 2.4 miles from MBK Shopping Mall. Suvarnabhumi Airport is 14 miles from the hotel. The air-conditioned guest rooms at the hotel come with modern décor. Each room is well-equipped with a TV and refrigerator. A hot shower is in each private bathroom. Guests can take a dip in the swimming pool or relax in the hot tub. The hotel offers baggage storage facilities at the 24 hour front desk. Car rental and travel arrangements can be made at the tour desk. C-Shop & Restaurant serves a selection of Thai and international dishes. Room service is also provided. Swissôtel Nai Lert Park Bangkok is in 8-acres of landscaped grounds, within walking distance of Ploenchit and Chidlom BTS Skytrain stations. It offers an outdoor pool and 8 dining options. Guests can exercise at the fitness center, or enjoy a relaxing massage at the spa. Swissôtel also has an aerobics studio, an air conditioned racquetball court and 2 tennis courts. From their modern rooms at Swissôtel Nai Lert Park, guests enjoy views of the pool and grounds from the floor-to-ceiling windows and private balconies. The bathrooms come with both a bathtub and shower facilities. The extensive dining choices include Italian, French, Cantonese, Japanese and local cuisine. Swissôtel has an outdoor dining terrace and a pool bar. Swissôtel Nai Lert Park Bangkok is a 40-minute drive from Suvarnabhumi International Airport. Situated in the business district, the hotel provides easy access around Bangkok and is close to its famous shopping centers and nightlife, with international facilities offering a comfortable stay. Ramada D’MA Bangkok provides a spacious setting, with a complete fitness and health center. You can keep trim at the gym, enjoy a dip in the pool, or relax in the spacious lobby bar with a drink in hand. The hotel is work friendly with a business center and banquet facilities. The hotel also features an international restaurant serving breakfast, lunch and dinner, a poolside snack bar and 24-hour room service. Ramada D’MA Bangkok is conveniently located close to the expressway for access to and from the airport. It is also across from of the Makkasan Train Station from which you can get to the BTS Skytrain and MRT Subway station. Comfortable stays await at Pantip Suites' spacious accommodations, with its kitchenette and friendly staff. Featuring an outdoor pool, it provides free Wi-Fi and a free shuttle from MRT Lumpini subway station. In the business district of Sathon, Pantip Suites is a 10-minute drive from Silom Market. It is a 45-minute drive from Suvarnabhumi International Airport. Featuring a private balcony, well-furnished suites at Pantip Suites feature a comfortable living area with a sofa set and DVD player. They are equipped with a safe and ironing facilities. Take in views of tropical landscapes and lounging by the outdoor pool. Alternatively, guests can relax in the sauna or with a soothing massage after an active workout at the gym. Café Patnip serves delicious Thai dishes, a full international menu and all-day buffet. Outdoor dining and private dining areas are available. A 5 minute walk from Surasak BTS Skytrain Station, Holiday Inn Silom offers an outdoor pool and fitness center. It has a health club that provides a tennis court and sauna. Holiday Inn Bangkok Silom is next to Jewellery Trade Center, one mile from Patpong Night Market. Suan Lum Night Bazaar is 2 miles away, while Suvarnabhumi Airport is a 45 minute ride from the hotel. Rooms at Silom Holiday Inn feature soothing pastel décor. They come with cable TV channels and tea/coffee-making facilities. Guests can enjoy a pampering massage or relaxing soak in the hot tub. For travel convenience, Holiday Inn provides car rental and a tour desk. The Brasserie offers Asian and international dishes, while Tandoor Restaurant serves authentic North Indian cuisine. 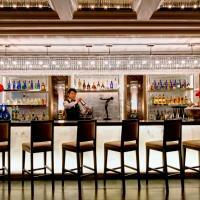 Drinks can be enjoyed at Orchid Lounge or Hari’s Bar. All Seasons Bangkok Siam Hotel is conveniently located near the Pratunam market district. It offers clean and comfortable reasonably-priced accommodations with personalized service from the warm and friendly staff. Just a 40 minute drive from Suvarnabhumi International Airport, rooms at the All Seasons are classically-styled and offer the basic amenities needed for a restful stay. Wi-Fi internet access and 24-hour room service is also provided for the convenience of all guests. Guests can have a good start to the day with breakfast at the hotel's on-site restaurant, which serves delicious Thai and international cuisine. All Seasons also features a coffee shop and bar that is ideal for winding down after a long day out. All Seasons Bangkok Siam Hotel is only a 5 minute walk from Suanpakkad Palace and Suansantiparb Park. It is also close to Victory Monument BTS Skytrain Station and a bus stop, providing easy public transportation to travel around the city. All Seasons Bangkok Hua Mark offers reasonably-priced accommodations that is close to the airport, within easy reach of town, as well as several night markets and malls. Rooms are decorated in a contemporary style and offer air conditioning and 24-hour room service. Free Wi-Fi is available for 15 minutes per day. Lounge by the swimming pool with a cool drink or enjoy a work-out at the fitness center, which is open daily. Enjoy a meal at iCafe, which offer Thai and international favorites with pasta and noodle selections. Unwind with a cocktail while enjoying the sunset or have supper under the stars at Azure. The luxurious lebua State Tower is in Bangkok’s Silom Area, overlooking the Chao Phraya River. The hotel features a rooftop restaurant and a free shuttle to Saphan Taksin BTS Station. Guests can enjoy free Wi-Fi and free wired internet in the rooms. The modern suites at State Tower lebua feature beautiful views of the city and river. All come equipped with a LCD TV, DVD players and large private bathrooms. Guests can swim at the outdoor lagoon pool or enjoy a relaxing massage treatment. The hotel provides a well-equipped gym and steam room. The open-air Sirocco Restaurant serves Mediterranean dishes and has spectacular city views. Cocktails and drinks are served at Sky Bar. A daily buffet breakfast is available. lebua at State Tower is approximately 22 miles from Suvarnabhumi Airport. A 5 minute walk from Sukhumvit MRT station, Dream Bangkok is on Sukhumvit 15. It offers a rooftop swimming pool, spa and rooms with 42-inch flat-screen TVs. Free internet and parking are available. The stylish rooms at Bangkok Dream are spacious with modern décor. Each room features cool blue lighting and allergen-free pillows. Other amenities include a minibar and DVD player. Guests can visit Oasis Spa for a relaxing Thai massage or work out at the gym. The hotel offers laundry and dry cleaning services. Currency exchange services are also available. Flava Restaurant offers views of Bangkok city, and serves up a wide spread of Asian and Western dishes. The Flava Lounge provides a comfortable venue for guests to sip their cocktails while enjoying live music. Dream Bangkok is 12 miles from Suvarnabhumi Airport and 2 miles from MBK Shopping Mall. In Old Bangkok, Prince Palace Hotel is right above Bo Bae Tower - a wholesale clothing market. Overlooking Mahanak Canal, the hotel offers an outdoor pool and 8 dining options. Rooms at Prince Palace are beautifully decorated and well-furnished with air conditioning and cable TV. Bathrooms are modern and feature a bathtub. Guests can relax by the 2 hot tubs and enjoy massage treatments at the spa. The hotel provides a business center and tour desk. Laundry services are available. Chinese, Vietnamese, Thai, Japanese and international dishes are served at the hotel’s 4 restaurants. Drinks are available at the Sky Lounge & Karaoke, Palace Bar, Sunset Beer Garden and Piccadilly Pub. 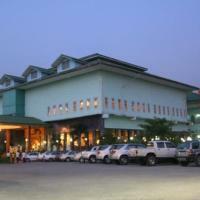 Prince Palace Hotel is approximately 16 miles from Suvarnabhumi Airport. Shopping attractions like Pratunam and Khaosan Road are a 10 minute drive away. The Ambassador offers both spa and therapy room right in Bangkok’s nightlife area, Sukhumvit 11 Road. Providing free parking, it is topped with an outdoor pool and 8 cafe venues. Bangkok Ambassador Hotel is just 100 yards from Nana BTS Skytrain Station, and less than one mile from Queen Sirikit National Convention Center. Suvarnabhumi Airport is a 30 minute drive away. The air-conditioned rooms feature colorful furnishings, a plasma TV and a large minibar. The private bathrooms have a marble decor, and come with toiletries. Guests at Hotel Ambassador can get active at the fitness center or shopping plaza, or they can recline in the hot tub, sauna or steam rooms. The hotel provides a tour desk as well. Hong Teh Chinese Restaurant features a Dim Sum buffet, while the Am Cafe offers all-day international buffet dining. Room service is available 24 hours at Ambassador Hotel Bangkok. Located off of the lively Sukhumvit Road, Grand Sukhumvit Hotel Bangkok is also just 525 ft from Nana Skytrain Station. It has an outdoor pool, a fitness center and 4 dining options. Free Wi-Fi is available throughout the property. Grand Sukhumvit Hotel Bangkok provides easy access to shopping, dining and entertainment options. Popular areas like Pat Pong, the MBK Shopping Mall and Suan Lum Night Bazaar are within 2 miles of the hotel. Spacious and well-furnished, rooms are at Grand Sukhumvit provide all the comforts of home. They are equipped with a flat-screen cable TV, spacious work space and modern private bathrooms. Recharge with a dip in the swimming pool or enjoy a workout at the fully equipped fitness center. Guests can also relax in the hot tub or indulge in a massage. Cafe de Nimes is an all-day dining restaurant which serves Mediterranean and Asian cuisine. Grand Sukhumvit also has a bakery, a lounge and 2 bars where guests can unwind. 24-hour room service is available. Housed in a refurbished building originally built in 1892, Shanghai Mansion recreates the elegance of Shanghai in the 1930s. In Bangkok's Chinatown, it offers a restaurant and jazz bar. This boutique hotel is within walking distance of Hua Lumpong MRT station. The colorful nightlife along Chao Phraya River is a 15-minute drive away. Free tuk-tuk (trishaw) service is available to several city attractions. Decorated with brightly colored silks and furniture, rooms at Shanghai Mansion feature a flat-screen TV, DVD player and laptop-sized personal safe. A minibar and tea/coffee making facilities are also available. Guests can enjoy Chinese board games and books in the library, or relax by the water garden. Facilities include a tour desk, business center and cash machine. The hotel provides laundry and dry cleaning. Continental breakfast is served at the hotel. The restaurant offers a selection of Thai and Chinese dishes, as well as afternoon tea. Cocktails and live music are available at Cotton jazz bar. Boonsiri Place is only 10 minutes walk from the Grand Palace and National Museum, and 5 minutes from the vibrant Khaosan Road while conveniently set back in a quieter neighborhood. Free Wi-Fi is available in all rooms. A chargeable airport shuttle is available to deliver guests to the room, stylishly decorated with contemporary Thai décor. The free breakfast to begin each day combines variety and quality as does the authentic Thai food at the relaxing Bota Café. To keep in touch, there is internet access via computers near the front desk. Within walking distance also to Wat Pho and to the boat stop for Wat Arun, and nearby Banglamphu shopping area, Boonsiri Place give guests a story to tell. The Sukosol Hotel is a blend of colonial-style architecture and authentic Thai aesthetics, only a 3 minute walk from Phaya Thai Skytrain Station. It features a state-of-the-art outdoor pool and well-equipped gym and spa. Guest rooms at Sukosol Hotel are elegantly furnished with Thai décor accents and Art Nouveau-style teakwood. They all include a flat-screen TV with cable channels, a sitting area and private bathrooms. An array of diverse gourmet cuisines is offered thanks to the 5 restaurants of the hotel. The restaurants, the lobby and the public areas all feature antiques, artifacts and curios from around Asia and across the globe. The hotel offers free drop-off service to Phaya Thai Airport Rail Link Station, providing quick services to Suvarnabhumi Airport. The lively Pratunam Market is one block away. Free private parking is available on site. Forum Park Hotel is located in Sathorn, featuring an outdoor pool and fitness center. Free shuttle services to Chong Nonsi BTS Station and nearby shopping malls are provided. Park Forum hotel is 14 miles from Suvarnabhumi Airport and 2.5 miles from Seafood Market. It is also 1.5 miles from Lumphini and Silom MRT Station. Rooms at the boutique hotel are equipped with a safe and satellite TV. Private bathrooms come with both bathtub and hot shower facilities. Guests can laze in the sauna, or enjoy a refreshing dip in the outdoor swimming pool. The Diversion karaoke lounge provides a comfortable venue for singing entertainment. Currency exchange services and free parking are available at the hotel. Sathorn Café serves Western and Thai dishes, and is available for all day dining. For alternative dining options, JD’s Lounge offers a wide selection of light snacks and beverages. A 20-minute drive from Suvarnabhumi International Airport, A-ONE offers 4-star accommodations with a gym and free Wi-Fi in public areas. It features free shuttle to the metro station. Close to Sukhumvit Road with its variety of shopping complexes and Ratchadaphisek's nightlife strip, it is also near the Bangkok metro system. Rooms at A-ONE are designed with a modern feel and contemporary furnishings. The spacious rooms come with a glass window separating the bathroom and sleeping area. After a long day of work or play, indulge with a session at the spa with its traditional Thai massages and body treatments. You can also recharge with a work-out at the fully equipped fitness center that also has an outdoor swimming pool. Relax with a drink and beautiful music at the Piano Lounge or enjoy an international buffet spread at Gondola Restaurant. There is also a bakery where you can get delicious homemade breads and pastries. Win Long Place Hotel is located in Bangkok’s business district, a 5-minute walk from Silom. It features a restaurant, spa and rooms with cable TV. Free Wi-Fi is available. The air-conditioned rooms at Long Win Place come with modern décor and hardwood floors. Rooms are equipped with a safe and minibar. Hot shower facilities are provided in the private bathrooms. Guests can enjoy traditional Thai body massages at the spa, or laze in the sauna. The hotel provides laundry and dry cleaning services. Room service is available upon request. Forty Seven Cafeteria and Pub serves a wide spread of Thai dishes and beverages. Other dining options are available at Suriwongse and Charoenkrung Road, a 5-minute walk from the hotel. Win Long Place Hotel is 2 miles from Suan Lum Night Bazaar and a 40-minute drive from Suvarnabhumi Airport. Thai Cozy House is located 3 minutes walk from Khao San Road, Thai Cozy House in the first guest house opened in Tanee Road. Far enough from the crowds, but still close to the action, Thai Cozy House takes a new approach to budget accommodation. A family run guesthouse with the services you would expect in a hotel!! We offer 38 clean, comfortable rooms. The Key Bangkok Hotel is located along Sukhumvit 19, a 3 minute walk from Asok BTS Skytrain Station and Terminal 21 Shopping Mall. The hotel offers modern rooms with kitchenettes, DVD players and free Wi-Fi. Air-conditioned rooms at The Key come with dining and lounge areas, all furnished with warm lighting and hardwood floors. Contemporary amenities include a 29-inch cable/satellite TV and free tea/coffee making facilities. The Key Bangkok Hotel is 13 miles from Suvarnabhumi Airport. It is one mile from Seafood Market and Queen Sirikit National Convention Center. A daily light breakfast is served to guests in the comfort of their room. There are many restaurants within one mile and Tops Supermarket is right next to the hotel. For convenience, the hotel provides a 24-hour front desk with a tour desk and ticketing services. Laundry and business services are available. FuramaXclusive Sukhumvit is a 10-minute walk from Phloen Chit BTS Skytrain Station. It features an outdoor pool, a fitness room, restaurant and spacious rooms with kitchenettes and free internet. Rooms at the Sukhumvit FuramaXclusive come equipped with satellite TV, tea/coffee making facilities and a minibar. A microwave oven and kitchen utensils are provided. Guests can sunbathe by the hotel’s pool or relax in the sauna. A fitness room lets guests enjoy an energetic work-out. Free private parking is available. Traditional Thai dishes featuring fresh organic ingredients are prepared at the La Cuisine Restaurant. Outdoor dining and room service are also available. 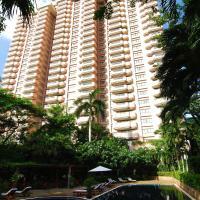 FuramaXclusive Sukhumvit is 550 yards from the Nana Market. It is located across from the Bamrungrad International Hospital. Boasting a privileged spot, this luxurious property blends a host of excellent facilities with a warm atmosphere. Nestled in 18 acres, this sophisticated resort offers the ideal base for unwinding and exploration. Embrace the proximity to the transport network and the attractions in the center. Options are endless at 13 Coins; sip refreshments in the bright bar and sample a range of delicious dishes in the charming restaurant or have a BBQ on the terrace. Get active in the impressive gym or embark on a spot of fishing and table tennis. Have a relaxing walk in the stunning gardens. Conduct business in this inspiring setting and embrace the range of professional facilities offered. Special 24-hour stay offers. Check-out 24 hours after your check-in time. In the heart of the entertainment district, 13 Coins Tower Hotel Ratchada is conveniently situated for shopping, nightlife, Thai massages, Muay Thai Boxing and more. Located in the middle of Ratchadaphisek Road, Ratchada 13 Coins s within walking distance of the subway system for easy access around Bangkok. A few stops north will take you to the Chatuchuk Weekend Market and a few stops south will take you to Bangkok's famous Sukhumvit Road. Clean and safe, each room at Hotel 13 Coins is decorated in a classic grand European style and all are complete with air conditioning. At the 13 Coins Ratchada Restaurant, steak, pizza, pasta, Thai food and seafood are cooked to order, with over 400 items on the menu and over 30 years in service. The restaurant features live entertainment. Special 24-hour stay offers. Check-out 24 hours after your check-in time. An ideal home base in Bangkok, Adelphi Suites offers serviced apartments with concierge service right on Sukhumvit 8. Facilities include a fitness center, an outdoor pool and a restaurant. Rooms at Adelphi Bangkok feature floor-to-ceiling windows, lounge areas and a kitchenette. Amenities include a flat-screen TV, DVD player and a washing machine. Suites Adelphi has a 24-hour front desk, and offers business facilities and internet access. Day trips can be arranged at the tour desk, and babysitting services are available. Monsoon Café and Restaurant serves a delightful range of local and international dishes. Drinks and light snacks are available at the Cocktail Bar. Adelphi Suites Bangkok is just a 2 minute walk from Nana BTS Skytrain Station, and less than one mile from Suan Lum Night Bazaar and Emporium Department Store. Suvarnabhumi Airport is 13 miles away. Centrally located in Bangkok, Amarin Inn provides a peaceful retreat amidst the busy and colorful streets of the city, with its cozy rooms and traditional Thai hospitality. Minutes away from popular Khao Sarn Road and the Banglumpoo shopping area, rooms are cozy and provide air conditioning and an private bathroom. Quiet and peaceful, Amarin Inn provides a beautiful view of the Bangkok skyline from the rooftop. Besides shopping, indulge with a Thai massage or head out to shop or explore the various cultural attractions; Amarin Inn's friendly staff will be able to advise you on your travel plans. The stylish Citichic by iCheck inn is on Sukhumvit 13 in the heart of the city. Featuring colorful furnishings and modern interiors, it showcases free Wi-Fi and a rooftop pool. Guests enjoy free shuttle service to Nana BTS Skytrain Station, which is a quarter mile away. Citichic by iCheck inn enjoys easy access to the main Sukhumvit Road and within walking distance of restaurants, bars and shops. Suvarnabhumi Airport is less than a one-hour drive away. Rooms at Citichic by iCheck inn have polished hardwood floors and glass-walled bathrooms. Each comes equipped with a flat-screen TV and tea/coffee making facilities. Select rooms have private terraces. Health conscious guests can exercise at Citichic's gym. The hotel has convenient services like free parking and a 24-hour front desk. Laundry and room service are also provided. All-day dining and a breakfast are available at Chic Cafe. In a striking building of Bangkok's skyline, Amari Boulevard is in Sukhumvit 5, only a quarter mile from Nana BTS Skytrain Station. It features a rooftop pool and modern rooms with floor-to-ceiling windows and free Wi-Fi. Rooms at Amari Boulevard Bangkok are spacious and bright. Each comes equipped with a satellite TV, air conditioning and a work desk. Bathrooms come with selected toiletries. Guests can work out at the fully-equipped fitness center or enjoy an in-room traditional Thai massage. Authentic Thai cuisine is available at the rooftop garden Season Thai Restaurant. Amari Boulevard hotel Bangkok is approximately 14 miles from Suvarnabhumi International Airport. Pratunam Market is one mile away. Free private parking is available on site. Enjoy the convenience of well-furnished apartments, an outdoor pool and a rooftop tennis court at Legacy Suites. On Sukhumvit 29, the property is a 10 minute walk from Asok BTS Skytrain Station. Legacy Suites Bangkok is a 10 minute walk from Emporium Shopping Center and Sukhumvit MRT Station. It is one mile from the Queen Sirikit Convention Center and 23 miles from Suvarnabhumi Airport. Offering a blend of modern and traditional décor, Legacy Suites come with dark wood furnishings and built-in wardrobes. Each room has a 32-inch flat-screen cable TV, kitchenette and free Wi-Fi. 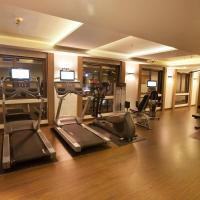 Enjoy the use of a well-equipped fitness center for regular workouts. The friendly staff provides a 24-hour front desk and business services. A daily breakfast buffet and all day dining are offered at Chillz Restaurant while Hama-Ichi features freshly prepared sushi. Room service can also be arranged.